The Sevmorput, nuclear-powered LASH carrier / container carrier of FSUE Atomflot, has left the port of Arkhangelsk for the Gydan peninsula today, 21 March 2019. According to Atomflot, the ship is loaded with general cargo of different types for the Arctic LNG 2 project. Under the Arctic LNG 2 project, the Sevmorput will deliver pipes, metal structures, containers and construction equipment of Russian origin. Farid Gabbasov, the Sevmorput Master, says the voyage from Arkhangelsk to the Utrenneye field in the Gulf of Ob will take no more than five days. 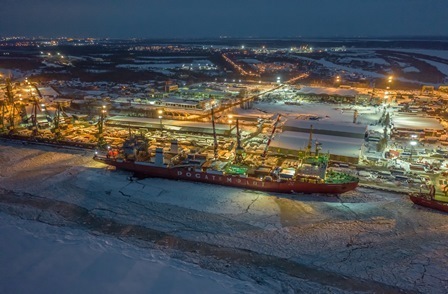 Upon completion of works at the Utrenneye field, the Sevmorput carrier will leave for Arkhangelsk to be loaded with the second batch of cargo to supply the Arctic LNG 2 project. The nuclear-powered icebreaking combo LASH carrier / container ship Sevmorput (named after the Northern Sea Route) was built at Kerch, USSR based Zaliv Shipyard. The Sevmorput was laid down on November 2, 1984, launched on February 20, 1986 and put into operation on December 31, 1988.